Winstep Forums • View topic - Want multi high-res displays on Windows 7? Read this first! Want multi high-res displays on Windows 7? Read this first! Post subject: Want multi high-res displays on Windows 7? Read this first! For a developer, screen real estate is always something very important. The more code you can see at once, the better - so screen resolution matters, a LOT. 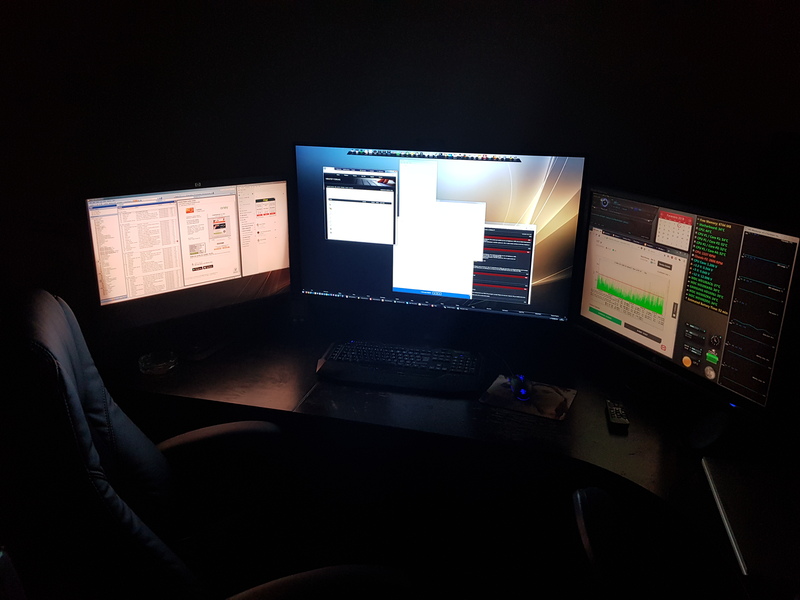 And since in this day and age we use many applications that are always running (we couldn't do that back in the Win9x days, as we would quickly run out of User and GDI resources), multiple monitors are a necessity too. My first big purchase in this area was a 21" NEC CRT monitor, back in the day when mainstream CRT monitors were all 14" and LCD monitors did not exist yet. That thing was a beast, heavy as a ton of bricks and very expensive, but since it allowed me to push it to its blurry limit of 1920x1440 it was worth every penny. 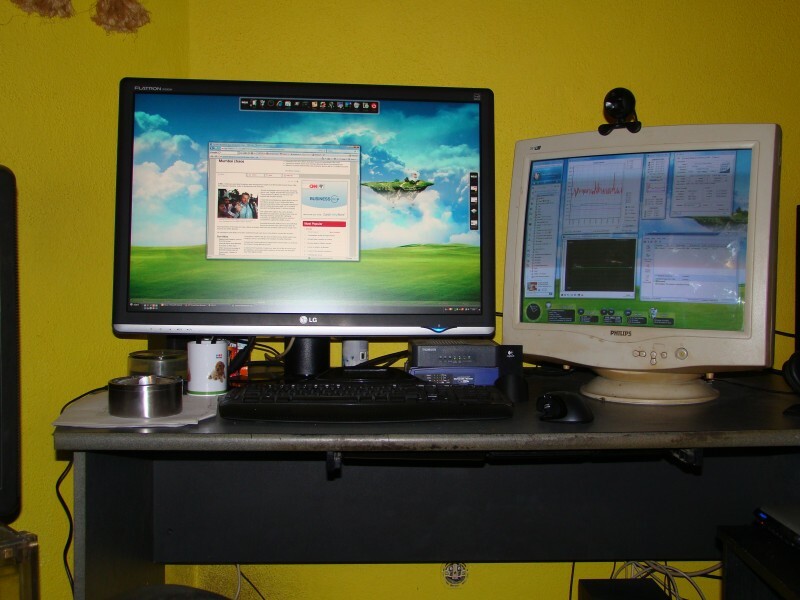 When the first 30" LCD monitors with a screen resolution of 2560x1600 made by LG finally came out, I managed to find and buy one of the only 3 monitors that existed in the country at the time. Actually got LG Portugal involved in the hunting. Eventually I settled for a gigantic setup of three 30" monitors at 2560x1600 each, two LG W3000H and one HP ZR30w (had to wait nearly a month for HP Germany to finally ship the monitor I ordered to HP Portugal). Unlike the LGs, which only have a single DVI input, the ZR30w has multiple inputs, which allowed me to connect it via DisplayPort and the other two via DVI. None of the 30" have on-screen OSDs, because, at the time, that was simply not possible at those screen resolutions. 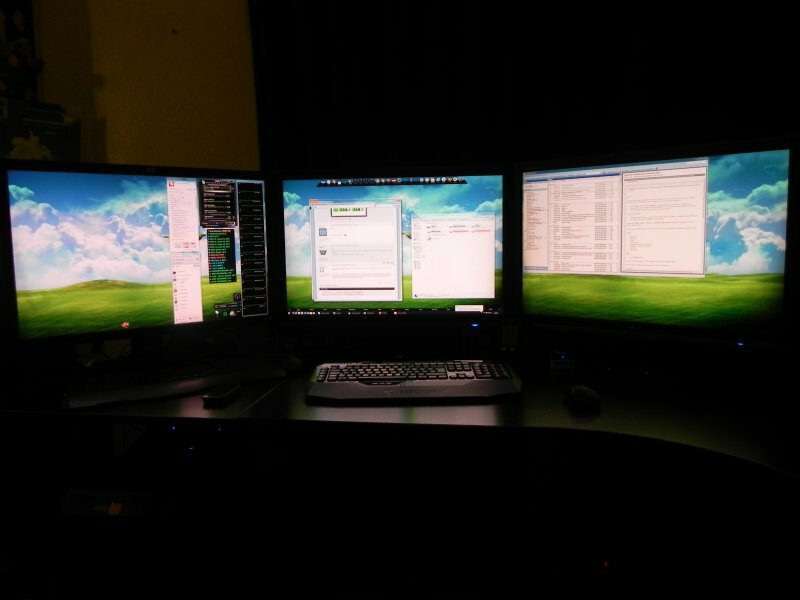 These three monitors have served me well for many years (had some problems with one of the LGs flickering from time to time, but, since it was one of the secondary monitors, it wasn't a big deal). Of course, with 4K finally becoming mainstream, I started keeping an eye on the market of 4K monitors. But here is the thing: text at 2560x1600 on a 30" monitor is already a bit small for some people (personally I love it though), and all the 4K monitors I saw were in the 27"-32" range. That is way too small for a 4K resolution, which meant people would have to turn on Windows display scaling in order to be able to read the text on the screen. This, in my opinion, totally defeats the purpose of getting a 4K monitor in the first place! ... until the LG 43UD79 4K monitor came along. This is a 43" 4K computer monitor (at TV sizes) with an absolute killer price: about $650-$700. Besides being an actual computer monitor with a 5ms response time (great for games), for that price it has a bunch of features, such as multiple input ports, picture on picture, the ability to plug in 4 separate devices to the monitor and display their pictures simultaneously side by side, etc..., that are not usually found on monitors twice the price. It even has a very useful remote control! 43" is the PERFECT size for 4K resolutions. With a monitor this big (huge, actually), everything is perfectly readable without display scaling. You do need a very large desk, of course. So, the idea was to get rid of the flickering 30" LG, and replace it with the 43" LG. The 4K 43" LG would be the central display, with the HP and the LG monitors sitting at the left and right of it. Now let me tell you this: the 43" LG is HUGE, GIGANTIC. It's like having a TV sitting right in your face. The image was crisp and bright, and the newly available screen real estate was a dream. But I hit a snag: as soon as I connected the 3 monitors (2560x1600 + 3840x2160 + 2560x1600) to my Windows 7 PC, Aero refused to turn on! Instead of nice blurred glass windows borders, I was looking at the very ugly Basic theme. Nothing I did seemed to fix the problem (even installed the latest nVidia drivers for my GTX 980ti) and any options related to Aero had mysteriously vanished from the Windows UI! The Windows Aero troubleshooter said everything was A-Ok though (liar!). I tried all the troubleshooting steps I could think of and find on the net, restarting the Themes and DWM services, etc, nothing worked! Aero would briefly come back, glass window borders with no content on a black background, then the screen would flicker and turn to Basic again. Until I read a comment that led me in the right direction. To cut a long story short, the Deskop Windows Manager (DWM) in Windows 7 uses a DirectX 10 texture to compose the screen. Turns out the maximum allowable size for a DX10 texture is 8192 pixels high x 8192 pixels wide. While three 2560x1600 monitors were still within this limit (3 x 2560 = 7680), the total width of my monitors with the new 4K display (2560 + 3840 + 2560 = 8960) now exceeded the maximum allowed texture size. As a result, the DWM would try to create a texture larger than DX10 allowed and crashed, throwing me back to non-hardware accelerated Basic mode. I had never heard of this limitation before, but there it is! There is NO fix to this problem on Windows 7 other than lowering the screen resolution of one of the monitors so that the total width of all the monitors is within the 8192 x 8192 DX10 texture size limit. That is what I was forced to do, with the 30" LG now running at 1680x1050 instead of the native 2560x1600. So, if you're still running Windows 7 and you want to invest in a couple of high-resolution monitors, be aware that this limitation exists! Windows 8 and Windows 10 use DX11, which already supports textures up to 16384x16384, so you won't have a problem there (at least not until 8K displays become the norm lol). Ooh, didn't know Win7 could support 4K UHD, useful to know. (Only just came across this by chance.) So maybe I could stick a 4K gfx card in my AMD x2 sys running XP/7, after all. But then again, my vision being as crap as it is, I can just about cope with 1600x1200 on my 22" anyway, although both my gfx card and the monitor go to 24xx x 16xx IIRC. I've been considering a 32", which I could get very cheaply, but what I ideally would have liked would be one of those rotating ones that you could use vertically, but apart from very expensive GFX monitors have only seen those in smaller sizes and lower res. As for 8K monitors, well Jorge if you're really stacked with cash you could already get one, they've been available for the GFX market for some time (and for about 20 years for the movie/TV industry), but price tags are enough to make one's eyes water.